The museum was much loved and represented years of devotion and commitment by its staff and volunteers, however by 2010 the museum was only open one day a week, the displays were outdated and the content no longer reflected the world outside its walls. The old museum was largely visited by senior medical professionals and researchers, and it was inaccessible to many service users and local people in Wakefield. In a climate of financial austerity, the Trust had to ask the question – why have a museum? Thankfully, in 2011 the Trust’s Change Lab initiative identified that a new museum had great potential to do more than showcasing the history of a hospital. 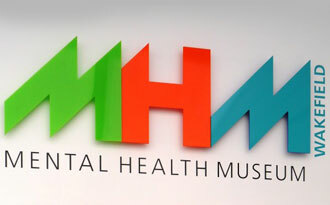 The Change Lab working group, made up of services users and carers, and supported by Trust staff, reimagined the Stephen G Beamount Museum as the Mental Health Museum – a space for broader debates about the history of mental health care, a place to break down barriers to wellbeing, combat mental health stigma and be active in social justice.